We used Lesley to sell our home recently. She is extremely professional and experienced. Lesley goes above and beyond to make the process seamless. She works very hard for her clients. If you are looking for someone to help you buy or sell a home, Lesley is the best. We could not have asked for a better realtor. Very professional at handling all aspects of our transaction. Hard, hard worker who prepared in depth for every meeting. She sold our house in 36 days for cash at full price. She was wonderful at getting a large number of potential buyers into the house. A great agent! Lesley Vann is like family now to our family. We are a former military family who has transitioned to Arizona from California. USAA assigned us with Lesley Vann as a result of our special real estate needs. Lesley Vann is well calibrated, adaptive & efficient under pressure constantly protecting our interest personal and financial. Lesley Vann appeared to be highly knowledgeable of Arizona's geographical locations, cities, neighborhoods, schools & communities based off of our request & interest. Locations are paramount along with your investment & watching Lesley Vann negotiate respectively & diplomatically on our behalf, she always received respectful results from other professionals continuously. Lesley Vann always made us feel like we were making progress, providing us with amazing results giving us choices. Large families making life changing transitions under time constraints is a challenge but Lesley Vann seemed to thrive the more challenges we presented her with, especially at last minute. We learned Lesley Vann is an former educator who keeps your child's interest in mind. Lesley Vann was above & beyond our expectations offering complimentary interior design assistance keeping us aligned with our design budget in mind. Selfless, professional, investigative, Lesley Vann worked for us. She made our family feel like we were her most important priority. We stepped back & observed how informative, connected, seasoned, postured & highly prepared she is. Conscious of health & sensitive to our needs, Lesley Vann always carried water & snacks making sure we were comfortable. Methodical, analytical, attention to detail, Lesley Vann made sure we were constantly on track with our goals & request. She is constantly advocating on your behalf with surprising results. We looked forward to working with Lesley Vann daily & excited about what new, fresh daily prospective she had ready for us. "Thank You" Lesley Vann for your heartfelt, tireless, efforts. "Your positive energy has shifted our paradigms to a new beginning & more efficient, educated perspectives." Lesley Vann attracts positive environments, She is accompanied by a multi-faceted, real estate-force of professionals, resources & tools ready to move us in constant "positive navigation". Lesley Vann is a breath of fresh air. Its been a pleasure to work with her and her team. I must say that working with Lesley Vann was such a pleasure. She was always more than on top of things and willing and able to do her best in my interest. She is most professional and unlike many of the realtors I have known in the past who want to just sign you up and then not do much after that in order to sell or market your home. I was and am most pleased to have had her for my selling agent. You can’t go wrong with Lesley! My husband and I had a wonderful experience with Lesley. We needed a realtor that showed initiative and would guide us to the right area in this big city as we were coming from Texas. Lesley listened to our requirements and shared many options giving us an honest and thorough overview of various areas. As our ideas changed she provided more homes to review. She was tireless and genuinely had our interest as a priority through the whole process. She takes care of all the details making the process as easy as possible even packing a cooler full of drinks and snacks" just in case." After closing she offered her knowledge of the area if there was any service we needed or questions we had. Now, five months later we know we made the right choice in a home and a realtor! We highly recommend Lesley Vann. You will not find a realtor that will work harder and bring top notch professionalism to your sale or purchase. A seamless and successful process! Lesley worked with my brother and me to sell our mother's house. The particular circumstances of our mother's home were unique, and we had felt challenged to move forward with selling until we hired Lesley. She brought creative ideas, a concrete plan, tireless implementation of this plan and an always upbeat, positive and enthusiastic approach. Lesley is smart, compassionate, wise, thoughtful and kind, and she turned what had felt like a difficult process into a seamless and successful one. I cannot recommend her more highly! Lesley makes the business of helping you buy or sell your home very personal. She distinguishes herself from all the other realtors we have dealt with in the last 10 years. Leslie not only helped us buy a home a few years ago but we were so impressed by her personal and caring interest in helping us achieve our goals that we chose her again when it was time to sell the same home. Since we were living in another state when it was time to sell our Arizona home, Leslie worked with us via telecom and online paperwork to get our house on the market. She walked us through the entire process up front so we knew what to expect. She even added all the warm touches to the décor (when I wasn’t there to do it myself) to ensure the home was staged and shown at its fullest potential. Leslie did a great job on the market research on the comps and helped us set the best price. The photography and marketing resulted in getting a lot of online traffic, interest and a top offer very quickly! During the showings she even went the extra mile to check on the house to make sure it was secure after other Realtors showed the property which gave us peace of mind. Leslie kept us updated through inspections and the closing process and was with us all the way through the signing ceremony. This was our 2nd transaction with Leslie and we were so thankful to have had such a great realtor that we recommended her to our best friends who just got top dollar for their home sale too. Leslie won’t disappoint and will make it her personal business to help you with your home buying/selling experience. "We hired Lesley Vann to sell our home of 18 years because of her genuine care for her clients. 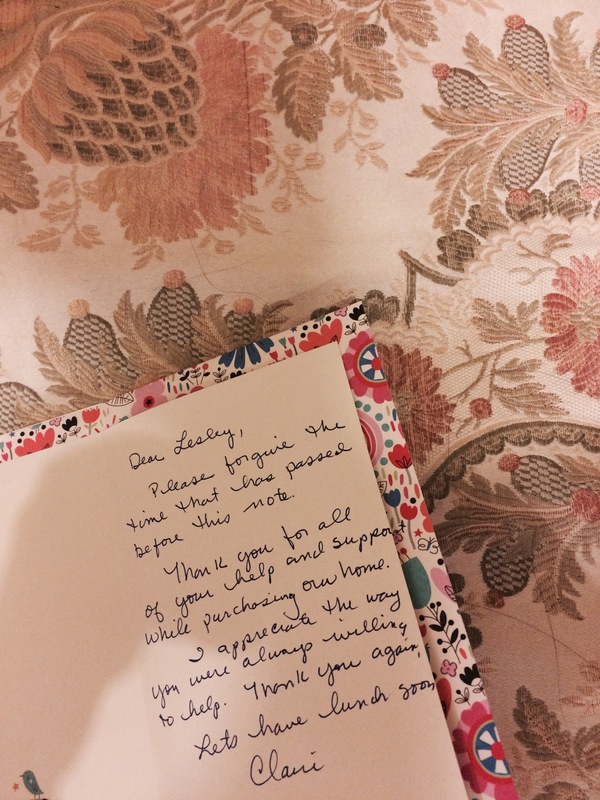 Lesley helped us at all phases: from helping us choose the right time to sell to shopping with me to stage our home. Our home sold in 6 weeks, thanks to her eye for details and her work at marketing our place. She is a professional and a natural at what she does. Thank you, Lesley." I would like to express my appreciation and gratitude for the support I received from Lesley. Lesley was an exceptional person to work with during my home search. Prior to coming out to Phoenix Lesley and I communicated several times so that our time together would be fruitful. Lesley was very helpful in guiding and preparing me for my time in Phoenix and based on our conversations Lesley designed an agenda for my visit. Lesley came up with a plan that was very well thought out and tailored to my requirements. All the visits we made were aligned with my needs. The days we spent together were beneficial and enlightening to me. For each home we visited Lesley was always well prepared. Lesley pointed out the nuances of the home that I should take into consideration as well as the area the home was located and the amenities the community or town had to offer. This allowed me to decide what home was right for me. Furthermore, the home buying process can be exciting but also a bit stressful. Lesley made it an enjoyable experience. After the day’s visits were done, we summarized our visits and discussed our plans for the next day. Leslie would work the evening and validate and prepare the visits for the following day and each of the next day’s visits went off without a hitch. The professionalism and the time Lesley spent with me was unparalleled and unique. What was unique for me is that Lesley had my best interests at heart. I am truly grateful for Lesley’s understanding and support. I am sensitive to the time Lesley spent with me and recognize all the hard work that is required on Lesley’s behalf. Lesley is an outstanding realtor and just as important a wonderful person who combines her passion for real estate and compassion for the buyer to provide an outstanding experience. I would not hesitate to work with Lesley again and would highly recommend anyone looking for a realtor that Lesley be the one for them in finding a new home and life. The service I have received from Lesley, Russ Lyon’s and USAA was exemplary. I was referred to Lesley through a personal friend. I owned my home for 12 years and my wife and I finally decided it was time to sell. We were initially nervous about being able to break even or make a profit in this market. When Lesley contacted us, we were hesitant at first since we have never gone through this process. Needless to say, Lesley was very up front and personal. She never made any promises except that she would sell our home. 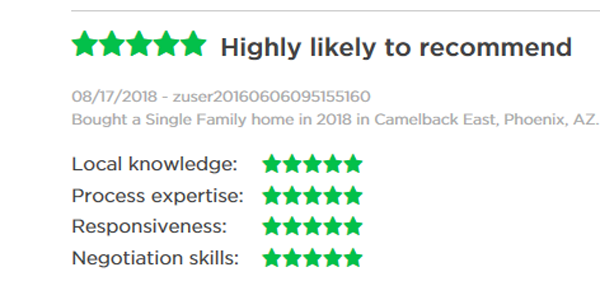 We informed Lesley of our requirements and to be honest we had specific requirements to sell our home especially since we did not need to sell our home it was more of a nice to do versus we were in a place where we had to sell. with this in mind we set a bottom line. Lesley stuck to that line and she fought daily with potential buyers. She did the right thing and informed us of every offer which came in....to which I became a little frustrated about that....but she was being truthful and transparent which literally surprised me in this day and age. I value honesty above most things and this really made me believe in Lesley and her firm. During my home sell, I was/am going through medical issues due to job actions...Lesley was always accommodating and willing to work around those issues in order to achieve our end-state. Never did she deviate from the end-state and when necessary, she made contact to provide input to help me stay on track. Lesley knows her market! She knows where to make an adjustment....AND....she is willing to listen and receive input even from someone who doesn't know the market. Her team that works with her is awesome to say the least. They worked diligently and efficiently to accomplish our goal. The entire process went smooth. I live about 4 hours away from Phoenix and not once did I have to drive to Phoenix to deal with any issues.....and that is if there ever were issues. If there were, then Lesley dealt with them and I was never bothered! I call that SERVICE! Lesley was always available for me to reach her if needed. in fact, she actually called me more than any of my family.....which doesn't say much, but we stayed in contact atleast twice a week. She texted almost every day with updates. Negotiation....yeah she is in all respectfulness.....a dog on a scent trail. We gave her our bottom line well before we even posted pictures of our home. Within the first 72 hours we received an offer well below our line and Lesley informed us and then went to work. We declined it and then on the third offer which was once again below our bottom line, Lesley stepped in with boxing gloves. The Buyer brought up their offer by 13K, that may not sound like a lot but when it comes down to what is needed to meet a bottom line it is a huge amount. Now, I will give credit to the buyer and understanding the situation and why we had a bottom line which Lesley provided that information to them at the right moment. And it was just the right touch at the right time. Lesley, You are awesome and I truly appreciate everything that you did for my Family and I. Thank you for bearing with me through my medical issues and all the military issues that I was dealing with. I cannot thank you enough and when I am in phoenix, we will get together and have lunch. And I will definitely work with you and your firm when I buy a home in Europe. God Bless You. We are writing to express our pleasure with real estate agent Lesley Vann who represented us in our recent purchase of our condo in Scottsdale, AZ. Lesley guided us through the entire process, from searching for the perfect condo to making the offer and closing the deal. We credit her with a smooth and stress free experience. Lesley has been one of the most hardworking and attentive realtors we have worked with, not to mention very personable. She always makes it a point to ask about our daughter and really connect on a personal level. To reiterate, we are nothing but pleased with Lesley Vann and would highly recommend her to anyone and everyone. "We wanted to say thank you AGAIN for helping us find the home of our dreams! You worked so hard to make this a reality and it means the world to us! We thought we'd send you this little gift so you may continue to feel inspired by the world and its many offerings! Wishing you all the best moving forward!" Thank you very much for all your hard work and patience with selling the house for us! You did an amazing job coordinating all the people and things we needed done to make the house look its best. We are very grateful! If we are lucky enough to have a chance to move back to AZ, then we will give you a call! Thanks again! The Word "Unrivaled" Really Does Say it All! - Susie and Mark H."
We've made several home relocations over the last 10 years, so we are recently and quite thoroughly versed in the sale/purchase/moving process. We also have experienced the good, the bad and the ugly among realtors. But now we have the pleasure of working with Lesley Vann and Russ Lyon Sotheby's International Realty as we consider moving from the east coast to Arizona. Lesley is a true professional, who strives to understand and meet our needs. She combines good listening skills with remarkable analytics and strategic thinking. Lesley's knowledge of the greater Phoenix and Tucson real estate markets as well as local and national builders is invaluable. She has extensive State, regional and neighborhood savvy, giving us confidence in her ability to match our interests with locations. And, although we are probably 6 months to 1 year away from a decision point, Lesley patiently and graciously shares her time, expertise and valuable contacts. We can unreservedly recommend Lesley Vann and Russ Lyon Sotheby's International Realty as consummate real estate professionals. "Lesley is a complete professional. In my 13 years of real estate, I can say that Lesley was very responsive and took great attention to detail. Ms. Vann is warm, friendly, & knowledgeable. She was always available and responded immediately to phone and email questions.We would highly recommend Lesley to any potential client. ~ Nick and Britt S."
Thank goodness there are Lesley's in the world! We are seniors and wanting to sell a condo in the old town area of Scottsdale was a real dilemma for us. We had 20 + years in the area during the winter season and now time to give it up. We had a card with Lesley Vann's information from a previous sale in our community, so we gave her a call. And fortunately for us we kept that information.! She immediately responded to our call, met with us, arranged for pictures, and did such a good marketing job. She is a great professional, very personable , and one we felt we could share our feelings with no matter how we felt. Offers came in quickly and a cash sale made all details go very smoothly. She was always in close contact and very aware of our needs at all times. We consider her a great person, honest, reliable, good communicator, and business oriented. Thank goodness there are Lesley's in the world! Lesley has been relentless in finding us a home! Lesley has been relentless in finding us a home within our perimeters. She knows the areas around Phoenix and what is available - sending us listings daily. Now that we have found a home, she is walking us through the steps (every state is different) to ensure the transaction is processed properly and all terms are fair and in our best interest. Highly recommended! Top Notch. The best we've ever had. Just to remind you - you’re a top notch realtor. The best we’ve ever had. Thank you for everything you’ve done in seeing this through and holding our hands through it all. Few would do what you have. We’re taking you out for a really nice celebration and singing your praises"
Lesley Vann is an excellent realtor. She sold our luxury home within 4 months. She had her photographer over before we established the online sites displaying our home. She brought the shoppers to us by establishing tours with realtors and lenders, who in turn promoted the property to interested buyers. Lesley worked on our home to show its best attributes, as we received Best of Tour 3 times, which was impressive for visitors. Leslie is an outstanding realtor, who is committed to her profession, sincerely very personable, but also very interested in what you think and wants your input. I was blessed to meet Lesley and had the opportunity to work with her in finding a new place in Arizona. The amount of time and effort Lesley put into this process is nothing short of extraordinary. I was able to entrust all the work in her while traveling and she absolutely went far and beyond, definitely exceeding my expectations. 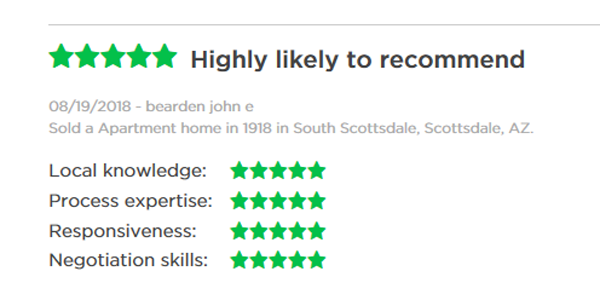 Highly recommended and I can assure you, it will be nearly impossible to find a realtor as knowledgeable and passionate as Lesley has demonstrated to me. Great communication throughout the process. I can honestly call her a friend. Thank you Lesley! Thanks - you are amazing; and I'm so thankful we're working with you! "You're a great person and a great agent"
Thank you for your help with this, Lesley. We truly appreciate all of your efforts. "You are the best, thank you Lesley!" "Thank you Lesley. I can hardly express to you the excellent job you're doing." "Wow you are an awesome cheerleader!" "Thanks Lesley. I am impressed with your initiative. See you soon." "Very good! Shows your professionalism!" "...We will let you know of any other needs but I believe you have taken care of everything. We will stay in touch! Now go sell another house! You are the best of the best!" Dr. Steve and Diane E.
"You did it! That was a tough one! Many would've dropped out. Good work!" "Woo Hoo! So happy to hear we are officially closed. Thanks for all your help Lesley. I know how hard you worked. "Thank you for all of your hard work Lesley!!! "You are great to work with and we too are grateful for your hands on partnership!" "Thank you for all you do Lesley!" Thank you for all your emails and time. You are a phenomenal Realtor! "You are a phenomenal Realtor. One of the best I've ever worked with." You give great super service when it comes to finding a home! "We just arrived home in Texas. Will be in touch regarding the other emails Lesley. You give great super service when it comes to finding a home!" Dr. Steve & Diane E.
"Thank you for all you do! You are excellent!!!" "You are amazing. I was worried that they were just a little too attached to their home and this might have been a fruitless endeavor. Thankfully you have amazing people skills and brought this negotiating to a successful conclusion." You are a very bright and intuitive person. "Lesley, I believe you are an excellent agent." "Lesley, thank you again for all your hard work. I really feel like you heard all my feedback and was delighted to cover as much as we did in a short span of time. We are so lucky to have you!Thank you again." "Thanks a lot for your coordination in finalizing this property. Hi Lesl​ey​ , Job well done! "Lesley, hello and congratulations on a lovely FB page. My thoughts and prayers are with you for success in connecting each client with just the right property. You deserve the highest and the best." Good going. Congratulations on nailing it." "Great job. Thanks for all your diligence." "Wow....you are really working hard here. Good job!" "You are so wonderful and I admire your energy! "Yahoo. Way to go. You made two older people with issues we can’t imagine very happy. Tks." "Lesley, I can only imagine that when you received the referral for this listing, the last thing you expected was for it to be this challenging. I want you to know how much I - and ultimately my family - appreciate the effort you continue to expend here. It does not go unnoticed. "Great news. Brian has chosen Lesley to assist with his home sale. After his experience with the other agent, he had asked for another agent but after talking with Lesley, he said there was no need for that second agent. I really appreciate that!" "You all have done a wonderful job..."
"...THANK YOU!!!! It was wonderful seeing you again and having such a great afternoon! ...It’s been great getting to know you and yes we must continue to keep in touch....I will not end this email with that, but with again, thank you for everything. It was truly wonderful...and I appreciate your kindness and friendship." "Thanks for all your help and time..."
"You have to promise to meet me some day!!! I really was so impressed with your diligence throughout this transaction. MMM was lucky to have you on her side. I never thought my client would stay in the game through 8 counters ( a record)." The listing looks great! The pictures and descriptions are excellent! Thank you so much for all of your hard work!! You are the best...I imagine you are one of the top realtors in your office!!! Thank you for working so hard on our house, Thank You! Just wanted to say happy holidays and thank you for working so hard on our house. Thank you! Have a great holiday and talk soon! Congratulations to you! The results you had on this transaction are a sign that you nailed this listing perfectly regarding the 4 P’s of Photography, Promotion, Presentation and Price. The 5th “P” is Patience which is reflected in the ~60 days on market and 30 days to close. I’m sure there were challenges bust most importantly, you got it done for your clients. Job well done Lesley. Sotheby’s should be proud to have you associated with them. I know I would be!! I just wanted to write you a note and say congratulations on the great year you had in 2016. You are a credit to our industry and a pleasure to work with. Thanks for being an important part of our Carefree team. Thank YOU, so very much!!! ...This has truly offered me hope, encouragement and inspiration….and, I believe I can speak for my wonderful brother David in that regard, too! ...Please know how very much I appreciate how accessible and responsive you are, always in touch in such a timely fashion!!!" "Thank you for all the time you have given to us. It is appreciated and will not be forgotten!!" "You have been overwhelmingly kind during this process and trust everything will turn out for the best for all concerned. Thanks again, Lesley!" "You're so committed to your work and clients, so heartfelt and genuine in all you do. You do great work!" Thank you. We will be home late Saturday afternoon. "Thank you Lesley. I appreciate your efforts...Thank you! "You are awesome! Thank you, Lesley! "It was good speaking with you, and I look forward to working with you to sell my home. "I totally understand why you have had great success! I wish you the continuous success of the real estate industry. Lesley thank you for your kindness and the time you put in to help. You are amazing. Lesley thank you again for your professionalism and time dedicated to help us. Moving forward I will call you a friend. I can’t wait for you to meet my wife and the boys. I continue to be more than impressed by your assistance and support. "As I have said before and want to reinforce, your assistance is OUT OF THIS WORLD! thx. Maurice." "Thank you for your help, Lesley. Thank you for being so dedicated to our property. We appreciate your unwavering commitment to us and our home. Kind regards. "Vicki and I met Lesley recently and found out what an experienced and knowledgeable person she has been to find our perfect home. I would highly recommend Lesley as a person to help you find that perfect home too!" We all know it takes a team to produce magnetic and profound results when real estate property photographs join with distinctive properties! It was my extreme good fortune to have met and worked with Jessica Peterson at the profound moment when I was "giving birth" to a new listing of global significance. Jessica, a total professional, arrived at the gated estate in the late afternoon, to do the daytime shoot. She was then able to capture magnificent sunset views for a long period of time, followed by an evening photo shoot where the entire back of the property was illuminated. With almost 7000 square feet of momentous architecture and interior design, Jessica handled this large assignment with aplomb. Not only did she progress with grace and ease through this demanding set of three back-to-back photo shoots, Jessica worked with such dedication and artistry, that she did not seem to notice the hours passing. We all left there around 11 PM, after, (what I would later learn would be), world – famous photographs had been taken. Jessica's photographs went all over the Internet and around the world with marketing totaling almost $100,000, which showcased Jessica's art and artistry. Her photographs spoke for themselves, revealing a property of almost stupendous beauty. Jessica's photographs touched the heart of the family who would become its buyers, and they purchased this property sight unseen (for a town's record-breaking sum), from the galvanizing and stirring quality of Jessica's photographs, alone. The rest is history. Thank you, Jessica. Words cannot describe my gratitude for our work together. You have a true and profound gift of photographic excellence. Thank you for bringing this gift to the real estate community, and to the world. Lesley Vann, Russ Lyon Sotheby's International Realty.